Homeschool Moms Have to Say "No!" "How do you juggle it all?" In today's society the ability to "juggle it all" is seen as a necessary skill - one to be sought after and often times rewarded. I don't know about you, but I stink at juggling. I am forever dropping balls. I need margin in my life. I need time and space for my relationship with God, and my relationship with my husband and children. Especially now that my kids are older I have to be intentional about every single thing we do. "I don't. My favorite word is NO and I use it often. I use NO often so that I can say YES to the things that truly matter." Homeschool moms need priorities. Choose 4 or 5 areas that are your focus. When people ask me to do things (as they frequently do) I have to evaluate where that fits into my priority list. If it doesn't, then I must say NO. Believe me, this was SO HARD for me to do. It took me four years of homeschooling to figure out how to do this and not feel bad about it. As I read over this post (especially the following section) it looks like I say NO to a lot, and I DO. But, I do this so I can say YES to my children, my husband, and a few activities we deem truly important. Life is full of seasons, and when your children are under your roof and you homeschool it is a season to prune outside commitments and focus on your family. 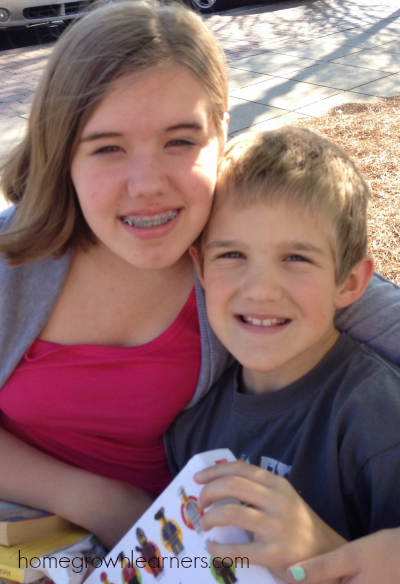 We are charged with discipling our children and that requires TIME and SACRIFICE. Society tells us we can be all things to all people. For me, at least, that is impossible. The consequences of not saying NO are disastrous. I want to have time with my children - time to curl up on the sofa and read a book, time to participate in service activities with my children, and time to just sit and listen to my husband at the end of a long day. There is nothing worse than being rushed, a lack of time, and a lack of PEACE. Also, it's pretty hard to homeschool when you're never at home! You don't have to offer any explanations or excuses. "No" is good enough and you don't owe anyone any explanations. 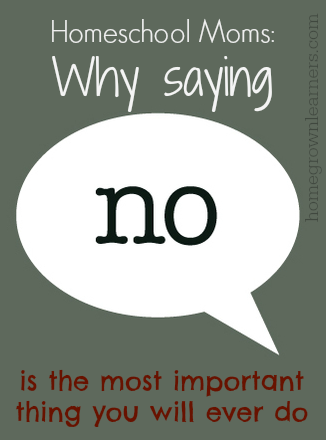 Many people won't understand why you have to say "no" to something, but you're aiming to homeschool your kids and take care of your family, not explain yourselves to people who don't have a stake in your life, right? Homeschooling is a FULL TIME JOB. If something takes away from your full time job you can't do it. This includes phone calls, computer time, and all the other little things that come up during a day. Here are some examples --- just to make you feel better! *Disclaimer: I'm not saying this is how YOU should respond -- it's how I am responding recently and it fits my life and situation currently. "Could you be a tutor for our CC Community?" "Could you run this errand for xyz family member (during the school day) since you are home anyways?" "Would you like to participate in a morning Bible study at the church?" "Do you want to meet for lunch/coffee?" "Are you in favor of playing travel baseball?" "Would you like to join xyz homeschool group? It's really just some field trips and an email list?" So.... what are your thoughts on juggling? This post is part of a series about How Homeschool Moms Juggle various things... I do realize it is in some mom's nature to juggle and they do it well - read some of their posts at the iHomeschool Network. Psst.... Starting this Wednesday, April 23 - The Ultimate Homemaking Bundle will go on sale. There are many homeschooling resources in this collection - you won't want to miss it!